Lots of Korean food is both healthy and delicious. While delicious, these meals are certainly not healthy. Nor are they recommended for regular consumption! 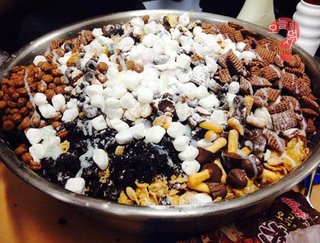 As recently noted on Korean website Instiz, last year some schoolgirls put their own unique spin on the traditional dish bibimbap. Here is a nice photo of bibimbap before it's mixed. Look at those veggies! This is good for your body. You stir all this up with a spoon. It's hot, healthy, and delicious. I love it. So, instead of making something hot and healthy, some students have gone in the complete opposite direction, making bibimbap cold, totally unhealthy, and, depending on your love of sweet things, heart-attack-inducingly yummy. I really wish they'd added enough marshmallows. In some photos, you can see ice cream, popsicles, cookies, marshmallows, cereal, and an array of chocolate snacks. In short, you see fat and sugar. Delicious! These images popped up on places like GreedEat and spread across numerous Korean forums. Again, this is not a traditional bibimbap dish, but the result of kids screwing around with friends and having fun. If you want to make your own untraditional bibimbap, you'll need lots of ingredients. But do not eat this by yourself. You will die. Benches always make it look like you have even more ingredients. Adding the ice cream is very important. But make sure to clean your plate. You don't want to waste all those calories!